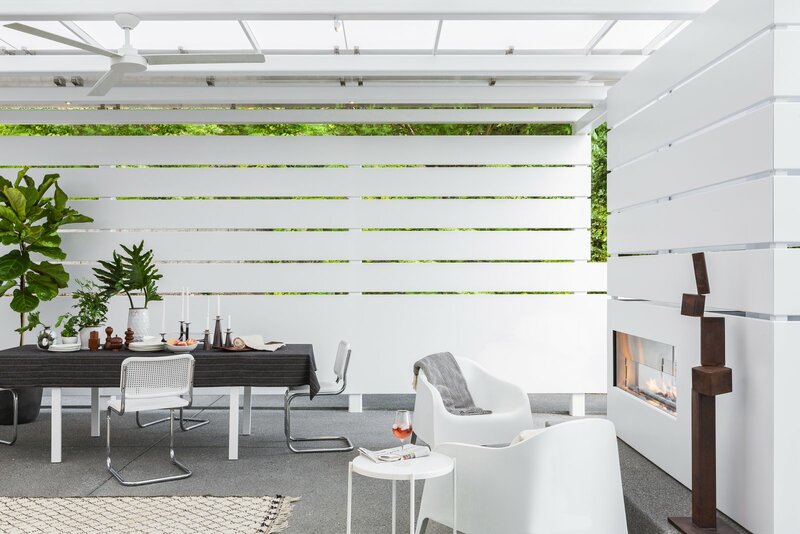 This project is a culmination of a rigorous modernist point of view and anticipating residential outdoor comfort in our magnificent yet challenging pacific north west weather. Sleet, snow, sun, shroud, all factors in how seasonally this space frames our weather. White steel, dewed and misted, contrast well with a dark gray winter day. Translucent roofing panels trim back the harsh summer sun. Mountainside winds deflected through defensive screening walls. Context: The home is of international modern style; white walls abbreviated with art, all washed with beautiful light through large windows that bounce off polished concrete floors. Through the enlarged front door, you are treated with an art gallery hallway. At the end is a large square window in which you can capture site lines of the steel and glass pavilion. 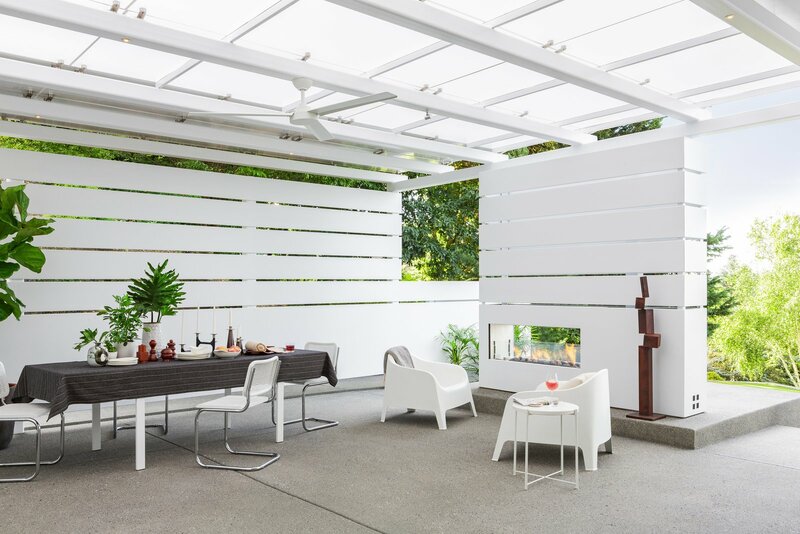 “Modern from the inside out;” the common thread is “a sculptural space for art collectors” says the home owner. The materials for the space have been extrapolated from the context of the home. White steel was an easy choice being that a design consideration was to force the structure to be light and slender. Beautiful white steel columns lift a flat plane of soft glowing glass. In the summer the glass radiates a stunning filtered light onto the ground with dramatic grid like shadows of its own purlin substructure. In the winter, raindrops patter on the glass in exciting and artistic arrangements. A screen wall flows through the space like a ribbon. Twelve-inch strips of steel with a one-inch design gap cut in and out and weave themselves through the pavilion. They do this to strategically frame the beautiful borrowed natural scenery and block undesirable views. One of the of the load bearing columns is masked by the steel ribbons that create the fireplace box. Height of the fire feature is imposing. This design element owns the most presence in the entire space. The fire place is see-through, and through you can catch glimpses of Mount St. Helens and beyond. Platforms on both sides of the fireplace can be enjoyed with low comfortable lounge chairs. Other furnishing includes a dining table with a beautiful handmade table cloth, a kitchenette that stores a barbecue and smoker, and lovely plants. 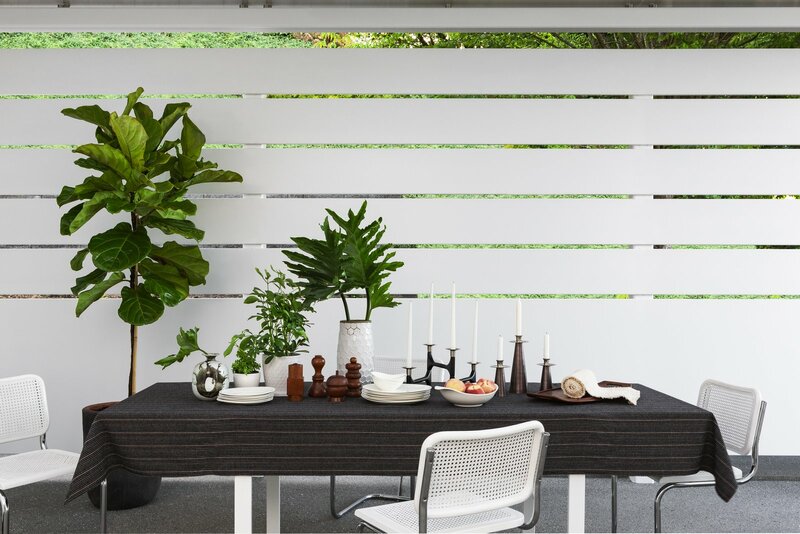 The plant selection are clippings of philodendrons, fiddle leaf figs, and bamboo palms. The tableware is by Eva Zeisel and was chosen for the elegant shapes that are unique in the shadows and light they create. The steel and glass pavilion is a beautiful addition to the architecture of the pacific north west. A space we want to live in and custom to a lifestyle which values nature and the outdoors.